Artists featured clockwise from top left: Eileen Sheehan, Hector Vega, Denise Buckley, Steven Simmons, Linda Zolten Wood. The fundraiser event held on Saturday, December 16 from 4 PM - 8 PM, will be set up as an art auction, with pieces being auctioned off as the night goes on. Local artists will be in attendance as well as Latina food and raffle baskets from local businesses and restaurants. The energy will be one of excitement and love for others, with a focus on raising funds for families in need in Puerto Rico. All proceeds will be sent to the Foundation for Puerto Rico. Shore Cultural Centre is sponsoring the space for the event, which will take place in their Community Room. Artists Hector Vega, Eileen Sheehan, Richard Romero, Linda Zolten Wood, Angelica Pozo, Denise Buckley, and Steven Simmons will be some of the many artists who are donating work to this event. On our Go Fund Me page, you can purchase a ticket by making a $10 donation under Reward Levels. Kids are free and walk-ins are welcome with ticket purchase at the door. We also are offering custom artwork for our larger rewards, a signed Hector Vega print for our Gold Sponsors who donate $250 and a custom painted rain barrel by the Collinwood Rain Barrel Project for our Platinum Sponsors who donate $500. Our current goal is set at $5,000 but we are confident we will raise more than that for our friends in Puerto Rico. You can donate or purchase tickets to this event by visiting our Go Fund Me page: www.gofundme.com/cleartforpuertorico. 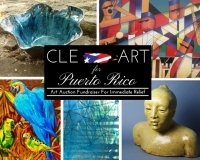 The CLE ART for Puerto Rico fundraiser is sponsored by the Create-A-Craft studio, and can be found on their events page: www.facebook.com/CACeuclid/events. Here you can view latest posts regarding artist donations and other news pertaining to the event, and invite your friends to join you. We believe artists create a powerful impact on the world around us. This is a great opportunity for artists to show their support for Puerto Rico in their time of need. We are currently seeking local artists to participate by donating a work of art that will be sold to help Puerto Rican families in need. Contact Eileen Sheehan at eileen@eileenstudios.com for artist/food donations. Monetary donations can be made at https://gofundme.com/cleartforpuertorico. Thank you for your support! Hello! I am a local artist and teacher and I create ceramic works of art for you and your home. I teach pottery at Shore Cultural Centre and am the owner of a local studio called Create-A-Craft where I offer paint your own pottery, canvas painting classes and private art parties for kids and adults! Visit www.create-a-craft.com for more information! I will be opening a new studio called Moss Point Arts within The Green House on Lakeshore Blvd. offering ceramics, enamel and glass fusing as well as curating an art gallery on the main floor.